Temperatures will likely stay below freezing across New Jersey for over 60 hours, from Wednesday evening through Saturday morning. I've been talking about it all week, and it's almost here - very cold air and a fierce wind arrive Wednesday night through Thursday morning. Such bitter cold is going to be uncomfortable, even painful, even dangerous if you don't take it seriously and bundle up. 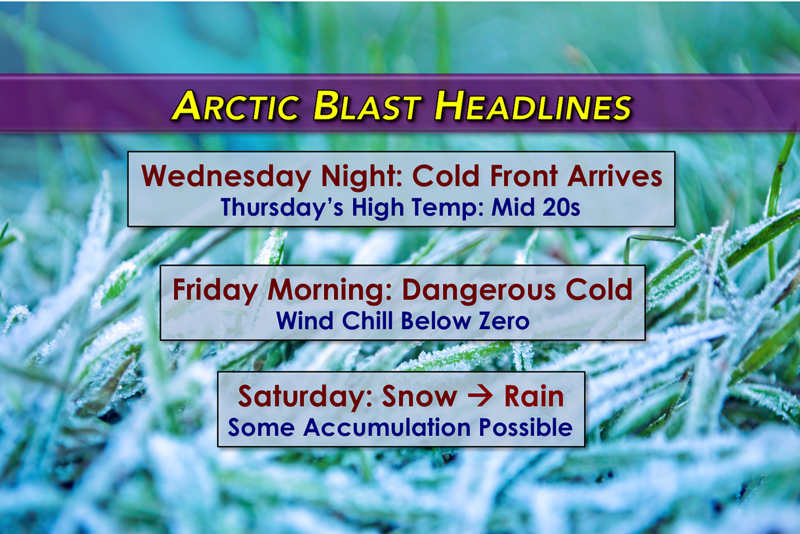 The door to the arctic will open wide late Wednesday night into early Thursday morning. As this strong cold front pushes through, limited snow showers and snow squalls will be possible. Just a dusting of snow may whiten the ground, while visibilities may be temporarily reduced within any snow bands. Meanwhile, overnight low temperatures will fall into the upper teens to lower 20s. Thursday will be very cold and blustery all day, with wind gusts as high as 40 mph. I say it all the time - cold and wind are a terrible combination. The cold wind will prevent thermometers from climbing above the mid 20s through Thursday afternoon. That is about 20 degrees below normal for mid-December. The core of this cold, dry air mass will be overhead Friday morning. Low temperatures will fall to the frigid 6 to 13 degree range. The wind chill ("feels like" temperature) will probably dip below zero across most of the state. That's "dangerous cold" territory. For the record, I don't use that phrase unless I mean it. Frostbite can quickly affect exposed skin in such conditions, and hypothermia can be life-threatening in a surprisingly short period of time. Friday's high temperatures will be limited to 20 to 27 degrees. While skies will become mostly sunny and winds will be a bit lighter, gusts to 30 mph will still add a significant bite to the very cold air. The good news for the upcoming weekend? Warmer temperatures will temporarily return. The bad news? The weekend will be messy, as a pair of storm systems will bring both wintry and wet weather to the Garden State. Saturday Storm System: Accumulating Snow? The forecast for Friday night into Saturday is complicated. A warm front will cause precipitation to overtake New Jersey starting between about 1 a.m. and 6 a.m. Friday. Temperatures will almost certainly be cold enough to sustain a period of statewide snow for the first part of Saturday. However, just like the snow event from last weekend, warmer temperatures will progress from south to north throughout Saturday morning. That will cause a transition from snow to rain. While there could be a brief period of freezing rain and icing in between, it's not a major concern for now. (I preface the following paragraph with my standard caution that this snow chance is still 72 hours away, with plenty of time left to change and evolve.) Models suggest there will be some snow accumulation for northern and even central New Jersey from Saturday's system. The best chance for snow accumulation will be north and west of the Route 1 corridor. The NAM model says up to 4" is possible, the Euro says upwards of 6", and the GFS goes up to an isolated 7" or 8". However, given the latest data, I think those raw model totals are overblown. We should transition to all rain by around 11 a.m. Saturday, putting a quick end to any accumulating snow. Also keep in mind, the warmer temperatures and steady rain will likely wash/melt a lot of that snow away through Saturday afternoon, so we wouldn't face a potential half-foot of snow for long anyway. We will be watching Saturday's system very closely and will keep you updated as it approaches. By Saturday afternoon, we'll enter a lull in the rainfall action with temperatures peaking in the mid 40s to mid 50s statewide. The second storm system of the weekend will be a cold front pushing through the state. Moderate to heavy rain will return starting around 7 a.m., finally wrapping up Sunday night. Again, this one looks to produce almost exclusively rain, thanks to high temperatures in the 50s for much of New Jersey. I wouldn't rule out some light snow shower activity on the backside of the rain and the front, as temperatures begin to drop again. We're back to the chilly side of the world on Monday and Tuesday, with high temperatures at or below 40 degrees.